Children around Wales are being offered free tennis coaching as part of a major programme to get thousands more youngsters playing the game. Tennis for Kids is a free six-week coaching programme for 5-8 year olds, who are new to tennis. The scheme was launched last year, and exceeded its GB-wide target of reaching 10,000 children. For 2017, the aim is to involve 20,000, with each receiving a free racket. In Wales, it is anticipated that more than 40 coaches will deliver 100 courses, with the aim of bringing 1,000 children into the game. The courses generally involve six free, fun sessions with an expert coach; a free racket to keep, if you attend regularly; the chance for parents or guardians to get involved; and the opportunity to continue at the venue once the course is finished. 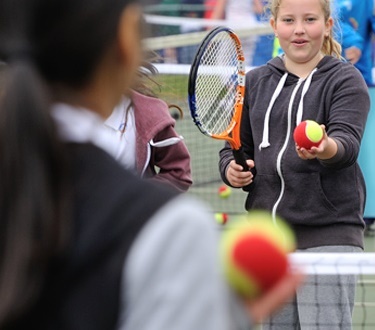 “Tennis for Kids was incredibly popular last year, building on the Davis Cup success, and this year we are aiming to take it even further by involving even more children,” said Tennis Wales chief executive, Peter Drew.